I like to thank my dog Sara for my back. She’s a dog with nine lives who has managed to overdose on painkillers, avoid almost certain cancer, and has recovered almost completely from a pretty bad disc herniation. She also has a penchant for overdoing it when she’s running free, so she’s spent a good bit of time in the Cone of Shame while recovering from this and that cut. 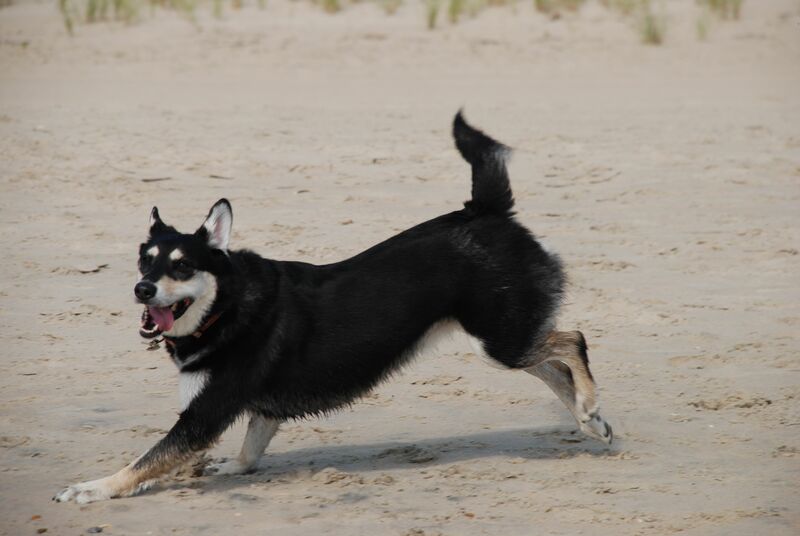 Sara is happiest when she's running, too. In November 2010, Sara progressively lost all use of her hips and down and regained it even slower. It was about 5 days downhill, and a good 9 months back up. Over a few months in that time, I carried her around or had to bend over to hold a sling to keep her back end moving. For me, that meant my own herniated disc. While Sara slowly regained use of her legs, it was hard not to laugh. She’s a very strong, independent dog, so she feels the need to Do Things Herself. Once while we were out hiking, she decided she wanted to run up to a puddle to drink. Well, her back end wasn’t working very well, so while her shoulders stopped, the rest of her kept going. Straight into the puddle, tail first. As I started feeling worse, and especially once I realized that my injury was as a result of caring for her, these kinds of episodes provided me with some comic relief. In February 2011, just as Sara became mostly whole again, I realized I needed to rest and figure out what was wrong with me. An MRI showed my herniation, which was causing sciatica and had me taking Advil 4 times a day for the pain. I rested for the entire month of March while attending physical therapy. I came back in early April and slowly regained my old form, and then started to improve quickly. 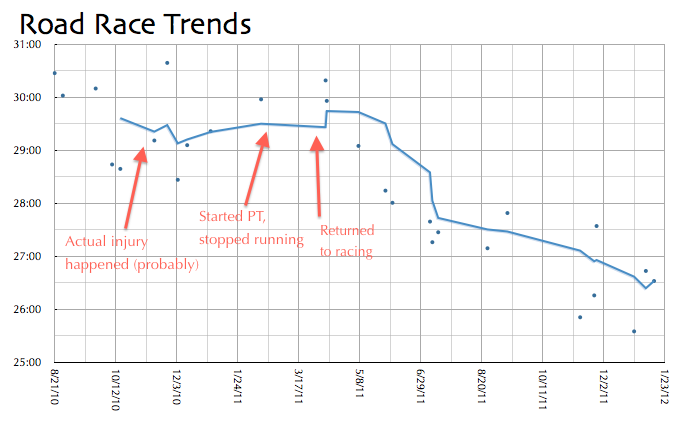 If you look at my race graph, you can see that it was almost as if I wasn’t injured. All of my races, normalized with a simple formula so I can compare them. Here you can see where I was injured, came back, and then improved. All of my recovery and improvement is great, but I still don’t have a week pass without my disc reminding me it’s not healed. I’ve heard it takes a long time to heal, and I may never be completely better from it. The Pilates class took me back to about 50%. I’m feeling some sciatica, and there’s a lot more tightness in the muscles around my disc. However, I’ve managed to avoid taking any Advil, so I know it’s not all that bad. The hardest part is that running doesn’t hurt it, aside from the normal inflammation after a hard workout. Unfortunately, that normal inflammation on top of my injury is a bit much. The thing that really hurts, though, is sitting, bending over, and lifting things. You know, the things you do every day. It’s frustrating because I am as independent as my little dog, so Doing Things Myself is something I also like to do. Now, let’s hope my dog doesn’t laugh at me every time I stumble a bit as I empty the dishwasher! Well, I skipped my tempo run this week. And my long run. And about 20 total miles. I only ran 10 for the week. I took from Thursday till Sunday off, thinking that if I can take care of myself now, I’ll be better for the future. It’s still 8 weeks to my race, so I have time. I’m also confident that I won’t lose fitness if I do this right. I plan to lower my miles for the coming week to 20-25 and make sure I’m icing, standing at work (which really helps), and letting others lift things for me. Finally, I will be watching myself carefully and resting if I need it. If anyone notices I have a weird stride over the next few weeks, let me know. So sorry to hear your back is giving you problems again and I know that recovering from an injury can take a lot of restraint, will-power and self-control. And I have done stuff like that myself – pushing myself too hard in a stretch, especially, has caused me (or aggravated) most of my problems, including my IT Band and sciatica pain. Glad you are being smart about it this time and I hope you have a longer recovery period next time. Hopefully each time your back is getting stronger and there is less chance for injury next time. I’m trying so hard to be careful. Sitting on an ice pack right now, in fact. Perhaps Cass and I should commiserate a bit, though I’m not really on the shelf like she was. I hope this heals up pretty fast. And I wish this will completely heal some day, but it’s hard to feel optimistic sometimes. Sciatica has a special place among the worst pains I’ve ever felt. I wouldn’t wish it on anyone. Are you dealing with any lately? It’s a strange thing, this injury. I really thought I had it to a stable, mostly-healed place. Stupid class. I think the key will be to ice and be gentle. And not lift a thing, which is so hard. I had to take the recycling out today, there was no way around it. It hurt, but what am I going to do, let the trash pile up?